and caring staff (pic below). dropped dead from a fatal heart attack. but this a real gut-wrencher. Are you wishing for a yorkie? you have not known pure joy! ......Buy only from a recognised registered breeder. besotted with a certain breed when there are just so many breeds in the dog world. On this page we will be having contributions from people who have become just that - HOOKED!!! as I have no yorkies. and I am sure the fact that she could not hear herself made her bark more. circumstances of her dear Lulu, and shared the pleasure of her lovely pups. Izzie came to stay. I got her through one of the unoffical rescues who move the dogs from foster to foster. imaginable. She was completely blind in one eye and gradually developed a loving trusting personality. now with an elderly couple as only dog and seems content as far as I can discover. I was assured I was top of the list for the next rescue, but six months later I am still unyorked. Rescue works in mysterious ways. true love and friendship that exists in this group and I value and appreciate everyone as a true friend. the ground capping off a perfect day. 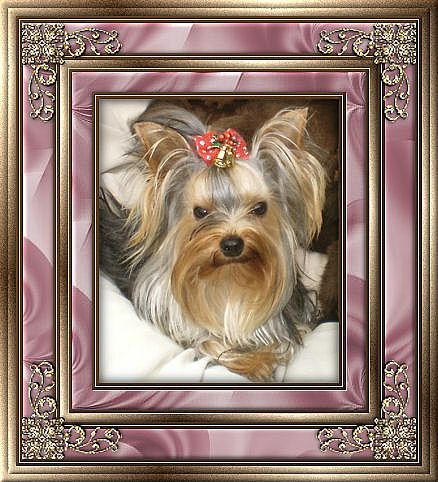 This is from Liz in South Africa, from the well-known Hlala Yorkies. Many thanks, Liz. worries me!" So Percy had to stay in the car - and furious he was about it too! and I very nearly settled for a little fluffy white Maltese Poodle (a non-registered SA breed which was all the fashion but now dying out, it seems). she gave me, Wisp, who became even more my soul mate, remain the most precious. pert manner of her walk. No–– It was her smile! eight months old." I was told. I knelt and stroked her silky coat and tickled her behind her ears. be followed by a few delighted yaps. favourite member of the family. Yorkshire Terrier– 'Yorkie', for short. laundry sink demanding to be bathed, if she felt she needed it. the deepest affection by all. Now, turning one year-old 'Babe' has become a member of the family. her up, suppressing a potential heart attack . presence and self importance, willing, if not anxious to please. 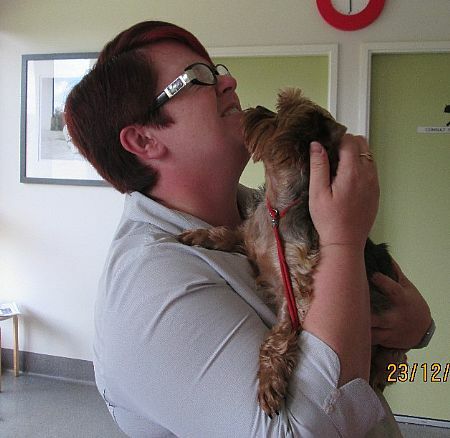 Once a Yorkie owner–always a Yorkie owner. Its love at first sight! to publish a book every 12 to 18 months ( Book 1 launched in December 2007). knitted jumpers & assorted toys. While she would not have won any ribbons for her beauty she had a very endearing nature. She went from being an outdoor girl living in a backyard shed to having full run of the house, including sleeping on the beds. someone’s lap after her evening meal. us one of the pups when it was ready to leave its Mum but we declined as we were most definitely “hooked on Yorkies”. “Wild Desire”. Bonnie on the other hand like Sandy is petite & far more demure “a proper little Madame”. home. He’s very loyal & affectionate to his immediate pack members & enjoys his cuddles just as much as Bonnie does. other. We presume they were partners in crime & smiled at the thought of the fun they must have had. but still enjoys his walks. Bonnie is more active & involved in her world & still enjoys a game of “throw the rope” just as Sandy did. However old they grow they will always be our beautiful Yorkie babies & very much loved members of our pack.